DalasBlogHow to Make Custom Covers !!! 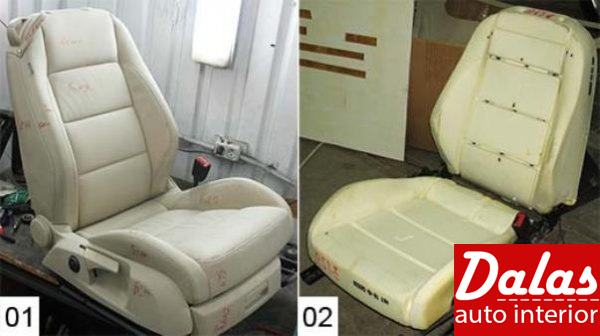 How To Make The Interior Upholstery Of The Car With Your Own Hands!!! The padding of the car seat deals with most aftermarket upholstery shop. And how many car owners want to try to sheathe the interior of the car with their hands… Because in this problem so much interesting! 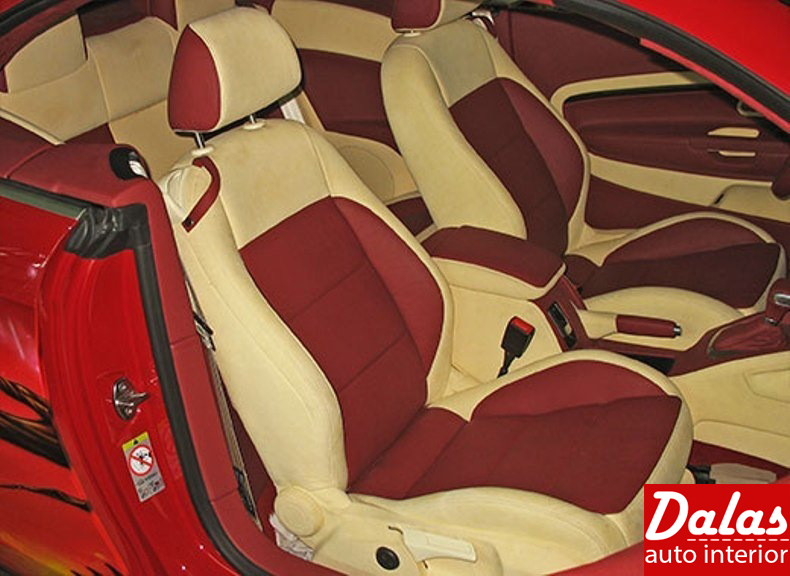 Any tuning project associated with the car interior trim requires partial or complete disassembly. This is not always an easy task-there are plenty of tricky fasteners in the car. 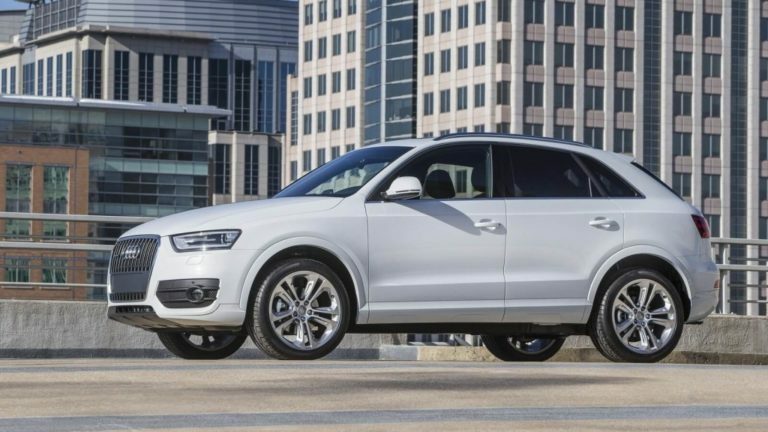 But intuitively you can guess where it can hide under the trim of the car piston, bolt or screw. Car seats are bolted through the runners to the floor. 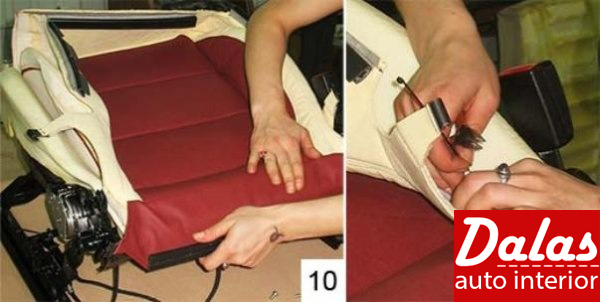 In order to remove the seat with your hands, it is enough to Unscrew the four bolts and turn of plugs connectors. 01. We pulled the seat out of the car and put it on the table to make it easier to plan the location of the leather peace and Alcantara on the seat belt cover. workers marked with a marker signed each cover panel with the name of the material from which it will be cut. 02. In order to remove the cover from the seat frame need strong hands. In the places of division into peace (in the corners of the adjunction of the leathers panels) on the back and the seat cover is pulled to the pillow frames with steel rings. The design of the draw is different, but the polyurethane cushion in any case strongly springs and holds the cover. 03. The removed seat cover passes into the hands of the cutter workers, a specialist in the car interior trim of the car. Master cuts case on a separate peace is preparing to transfer to new materials. 04. For example, planned for upholstery seats detail of Alcantara laid out on the table and pressed against Alcantara weights. Fortified with a gel pen for the outline and for combining patchwork is marked with short notches on the perimeter. Alcantara, like the leather, is easily cut with tailor scissors. 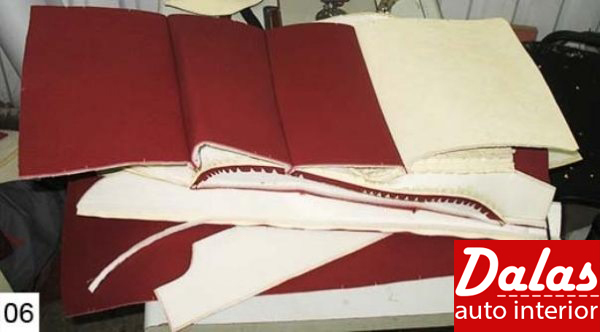 There is one very important task in the process of cutting the details of the upholstery seat covers of the car from Alcantara. Alcantara is similar to microfiber and has a short pile. The pile pointing in the same direction. Guess that the direction of the pile must be taken into account in the cutting? An error in the direction of the pile will look like a difference in the color and details will be broke. 05. 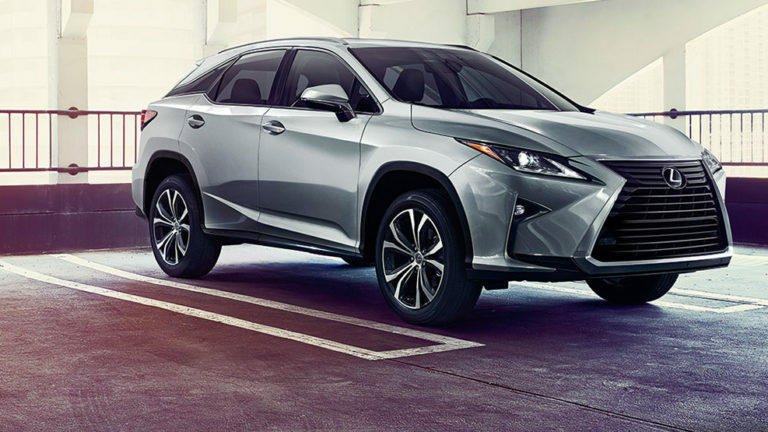 Upholstery seats and some other parts of the interior trim of the car cannot do without strengthening the leather and foam Alcantara on a fabric basis. Cut leather and Alcantara parts of seat covers are glued to the foam rubber (from the foam rubber, not fabric) with glue in a spray can. Foam and Leather should be glued together with a spray, should not be used for this operation brush – can own hands to ruin detail: glue goes deep into the pore and when squeezed glue the internal structure of the foam. Simply put, the foam will not return to its original position. 07. The next operation glue the seams on the back side of the covers. Question-what to glue to what? 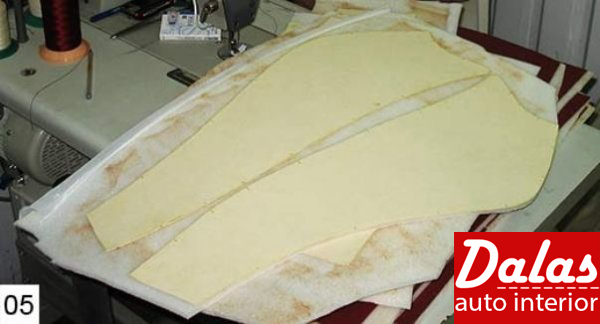 First, cut the strips of foam that remained near the lapels to clean the lapels of Alcantara and leather for gluing. Then, dilute the lapels of the skin and Alcantara to the sides and press them to the foam. An important point in the interior trim of the car-beating seams Alcantara and leather foam. The stitches are covered with a hammer. 08. Now the flaps are stitching together by double stitching threads. The free edge with the string line does not cut under the foam this will not be noticeable. You can trim the edges with your hands on the edge of the cover details. 09. Ready cover turns out on the front side and straightens. Pull and secure the cover on the seat frame is not an easy job. Especially the back cover-it has a closed shape and has to work in cramped conditions. 10. Cover seats also has its own problems. First, the cover is laid out on the seat cushion, and then it needs to be fixed to the frame. Plastic clamps are used to attract the seat cover in the middle. The clamps are passed through the airbag cushion, the holes are the same as in the native structure. On the cover of the clamp clings to the spoke, sheathed with fabric and sewn to the cover from the inside. The edges of the cover are stretched on the seat frame along the contour. The back is sewn to the dative case by a plastic clip (fight back from their seats), the sides and front for cutting through the seat frame. 11. The car interior trim always ends with drying and steaming of the rap parts. Seat covers are heated by a jet of hot air from the hair dryer – the leather, drying up, stretched like a drum. All seats steam through the cloth. 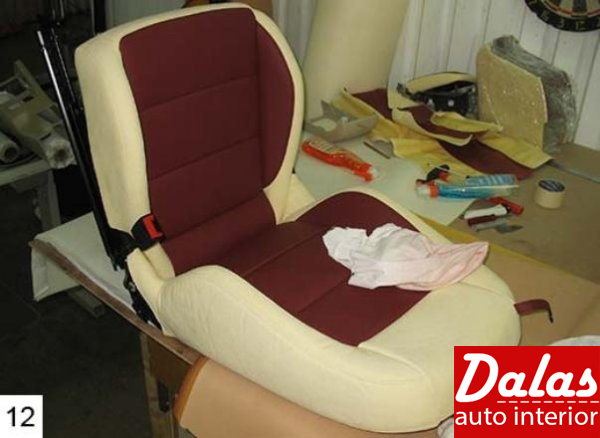 After these procedures, the seat leathers become absolutely smooth, as if made of solid material. I think these operations can be done by everyone with their own hands. 12. Yes, steaming is not all! Car seat upholstrey of the car after the upholstery have to be cleaned. 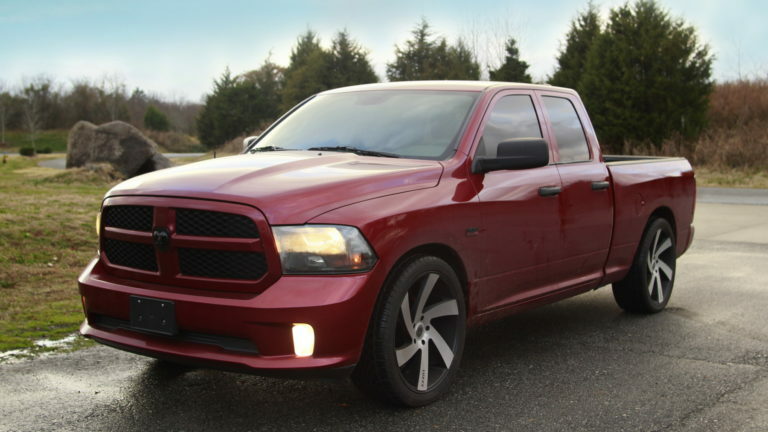 Especially the leather and Alcantara bright colors. Our seats were fingerprints, glue spots, Special detergent the master washes the traces of upholstery seats. By the way, the leather and Alcantara perfectly cleaned, even from heavy pollution. 13. The seats are fully assembled prior to installation in the vehicle. False panels, boxes, lids, levers are screwed, snap and cling to the seat frames. 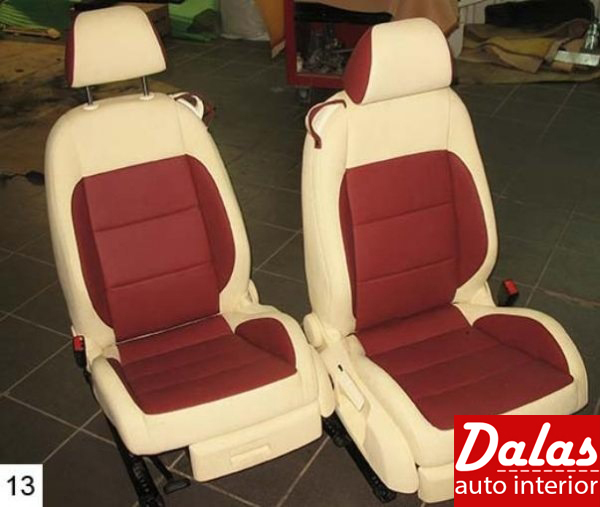 The interior trim of the vehicle, namely padding of the seat ends.